Chris Ollendike, EVP and Director of Sales explains what’s different about InvestEdge’s UMA solution and some of the efficiencies it provides. and institutions more effectively aggregate, transform and present complex investment data to better serve high-net-worth clients. Our Solution enables firms to streamline operations, simplify workflows and build stronger, deeper and more profitable client relationships. 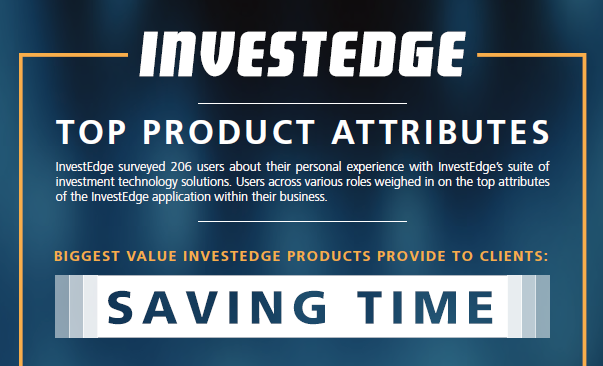 During our latest product survey, we wanted to understand our client’s personal experience with the InvestEdge platform to ensure we’re delivering solutions that meet our client’s needs. As a leading technology provider, our goal was to objectively measure the value clients gain from our solutions and better understand their overall level of satisfaction. See why firms choose InvestEdge and what they had to say. Thanks to unparalleled customer satsifaction and retention, InvestEdge is the fastest growing provider of investment technology solutions. We're committed to helping advisors deliver premium service to every account every time. Consolidated access to the information and tools that advisors, investment officers, performance personnel and compliance professionals need to achieve optimum productivity, profitability, and client satisfaction.